Download "Honda Extension to Manufacturer s Warranty Brief Details of Plan"
2 Honda Extension to Manufacturer s Warranty Plan Documents Dear Customer, This Honda Extension to Manufacturer s Warranty has been designed to fulfil our most exacting requirements and provide you with the most comprehensive customer package available in the event of the unexpected. To maintain your Honda Extension to Manufacturer s Warranty, it is essential that your Vehicle is Serviced on time by a Honda Dealer. 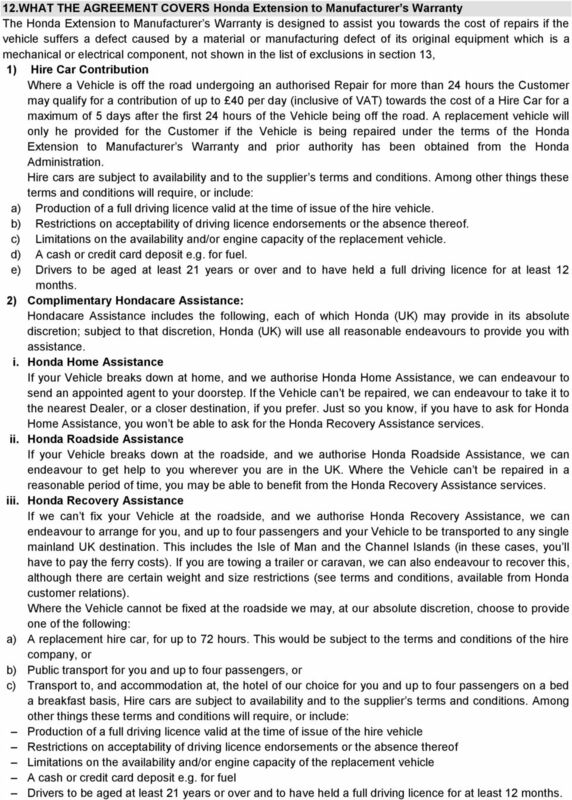 Should you have any queries regarding this document, please do not hesitate to contact the Honda dedicated Customer Service Department on , or your Honda Dealer. PLEASE READ THESE PLAN DOCUMENTS CAREFULLY AND IN FULL AS THEY CONTAIN ALL THE DETAILS OF YOUR AGREEMENT. 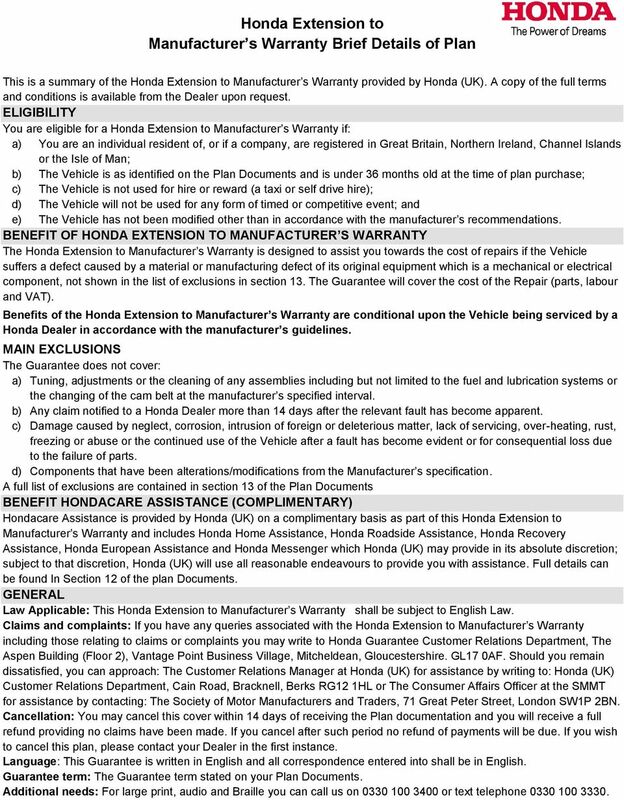 ELIGIBILITY You are eligible for a Honda Extension to Manufacturer s Warranty if: a) You are an individual resident of, or if a company, are registered in Great Britain, Northern Ireland, Channel Islands or the Isle of Man; b) The Vehicle is as identified on the Plan Documents and is under 36 months old at the time of plan purchase; c) The Vehicle is not used for hire or reward (a taxi or self drive hire); d) The Vehicle will not be used for any form of timed or competitive event; and e) The Vehicle has not been modified other than in accordance with the manufacturer s recommendations. 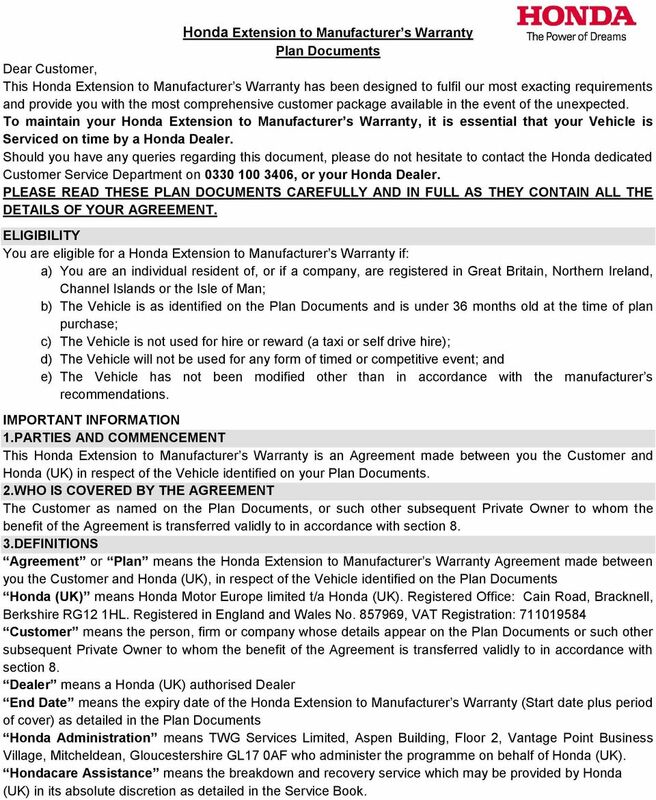 IMPORTANT INFORMATION 1.PARTIES AND COMMENCEMENT This Honda Extension to Manufacturer s Warranty is an Agreement made between you the Customer and Honda (UK) in respect of the Vehicle identified on your Plan Documents. 2.WHO IS COVERED BY THE AGREEMENT The Customer as named on the Plan Documents, or such other subsequent Private Owner to whom the benefit of the Agreement is transferred validly to in accordance with section 8. 3.DEFINITIONS Agreement or Plan means the Honda Extension to Manufacturer s Warranty Agreement made between you the Customer and Honda (UK), in respect of the Vehicle identified on the Plan Documents Honda (UK) means Honda Motor Europe limited t/a Honda (UK). Registered Office: Cain Road, Bracknell, Berkshire RG12 1HL. Registered in England and Wales No , VAT Registration: Customer means the person, firm or company whose details appear on the Plan Documents or such other subsequent Private Owner to whom the benefit of the Agreement is transferred validly to in accordance with section 8. Dealer means a Honda (UK) authorised Dealer End Date means the expiry date of the Honda Extension to Manufacturer s Warranty (Start date plus period of cover) as detailed in the Plan Documents Honda Administration means TWG Services Limited, Aspen Building, Floor 2, Vantage Point Business Village, Mitcheldean, Gloucestershire GL17 0AF who administer the programme on behalf of Honda (UK). Hondacare Assistance means the breakdown and recovery service which may be provided by Honda (UK) in its absolute discretion as detailed in the Service Book. 3 Honda Guarantee or Honda Extension to Manufacturer s Warranty means the extended guarantee affording cover against the Vehicle suffering a defect caused by a material or manufacturing defect of its original equipment of a covered component the Guarantee will cover the cost of the Repair (parts, labour and VAT). ICME means the Institute of Chartered Mechanical Engineers. Normal Working Week means Monday to Friday 9am 5pm, excluding Bank Holidays. Plan Documents means the complete Honda Extension to Manufacturer s Warranty documents covering the terms of this Agreement. Private Owner means an owner that is not a garage or a business connected to the motor trade in any way. Repair means the repair, replacement or rectification of a part or fault that is covered by the Honda Guarantee. Service Book means the Honda service booklet that comes with the Vehicle detailing the specific service requirements of the Vehicle and details of Hondacare Assistance. Service or Servicing or Serviced means the servicing of the Vehicle in accordance with the Honda standard service schedules as detailed in the Service Book. Start Date means the Honda Extension to Manufacturer s Warranty start date as detailed in the Plan Documents. Vehicle or Vehicles means the Customer s motor vehicle as detailed in the Plan Documents. 4.GEOGRAPHICAL LIMITS United Kingdom - Great Britain and Northern Ireland, including the Channel Islands and the Isle of Man. Europe - the following countries within Europe: Andorra, Austria, Belgium, Bosnia, Bulgaria, Croatia, Cyprus (excluding Northern Cyprus), Czech Republic, Denmark, Finland, France (& Corsica), Germany, Gibraltar, Greece, Hungary, Ireland, Italy (& Sicily, Sardinia & San Marino), Luxembourg, Malta, Monaco, Netherlands, Norway, Poland, Portugal, Romania, Slovakia, Slovenia, Spain, Sweden, Switzerland (& Liechtenstein) and UK. We reserve the right to amend the geographical limits in our absolute discretion and in particular to amend cover in the event of natural disasters, war, civil disturbance, riot or radioactive contamination. 5.CUSTOMER S OBLIGATIONS a) Ensure the Vehicle is Serviced in accordance with the service schedule, as detailed in the Service Book by a Dealer to maintain the validity of this Agreement. b) Undertake all Services within 30 days or 750 miles of the time or mileage stipulated in the Service Book. If any circumstances prevent the Services being carried out at the correct time, the Customer must inform Honda Administration on behalf of Honda (UK) immediately [in writing]. c) Produce to the Dealer the Plan Documents prior to each Repair covered by this Agreement being carried out. d) Give the Dealer authority to diagnose the fault including the dismantling of any component(s) before submitting a claim for a Repair. On acceptance of the claim Honda Administration will, on behalf of Honda (UK), cover the cost of dismantling. However, if upon dismantling it should be found that Honda (UK) has no liability, then the cost of dismantling must be borne by the owner of the Vehicle. e) Notify Honda Administration if their principal address, as shown on the Plan Documents, changes. f) Notify Honda Administration if the registration number or any other identification mark of the Vehicle changes. g) Not make, or permit to be made, any mechanical alterations or modifications to Honda (UK) s standard specification for the Vehicle without obtaining the prior written consent of Honda (UK). h) Notify a Honda Dealer as soon as possible and no more than 14 days after a fault in the Vehicle has become apparent. 4 6.DEALER S OBLIGATIONS a) Carry out Repairs to the Vehicle in accordance with the Plan Documents as soon as is reasonably practicable after being requested to do so by the Customer. b) Notify Honda Administration within a maximum of 3 days of the fault being reported by the Customer and input details of the Vehicle claim onto the Honda Application. If the Vehicle is within the set parameters, then authorisation will be given within 2 hours during Normal Working Week. If it is not, the Dealer will contact the Honda Claims Department on and obtain authority to proceed with the Repair/Service. c) Honda Administration may request the original service history documents and associated invoices. d) Prior to the sale of the Vehicle to the Customer (it applicable), check the Vehicle to ensure that the covered components listed in this Honda Extension to Manufacturer s Warranty are in sound condition. e) Use only genuine Honda parts, fluids and oils of the recommended specification, on Honda vehicles. 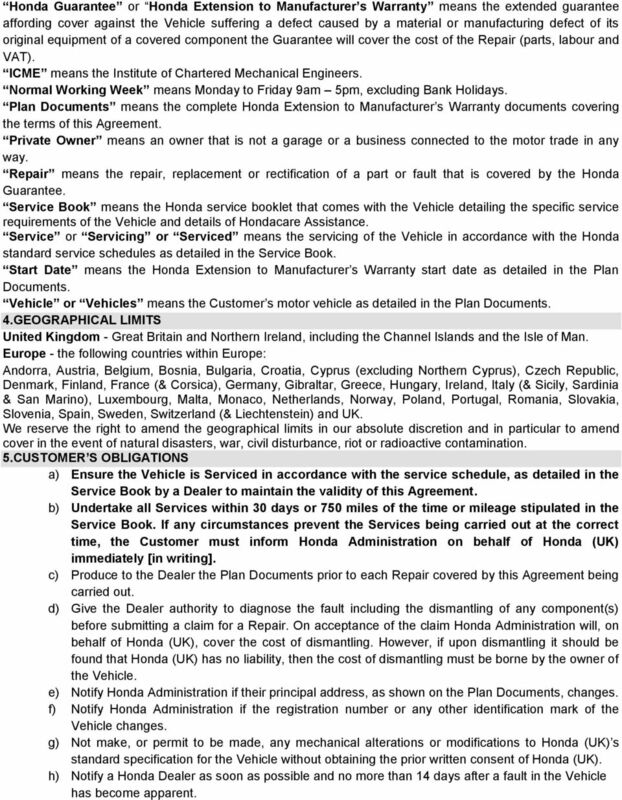 7.HONDA (UK) OBLIGATIONS a) Issue Plan Documents printed with an End Date, which indicates the latest date on which any Repair covered by this Agreement, may be carried out. b) Cover the cost of all authorised Repairs carried out by a Dealer under the terms of this Agreement 8.ASSIGNMENT a) The Customer may, transfer their rights and obligations directly to a new Private Owner under this Agreement provided that the new owner notifies Honda Administration of the transfer by written notice addressed to Honda Administration, Aspen Building, Floor 2, Vantage Point Business Village, Mitcheldean, Gloucestershire GL17 0AF within 14 days of the transfer, stating their name, address and the Vehicle s current mileage, and enclosing an administration fee of made payable to TWG Services Honda, along with a copy of the Service history (if any) for the Vehicle since the start date of this Plan. For clarification, the plan cannot be transferred by way of a business that buys, sells, repairs or trades in motor vehicles including where the Vehicle is sold or traded on to a new private owner by such a business. b) This Agreement cannot be assigned or transferred to a different vehicle. 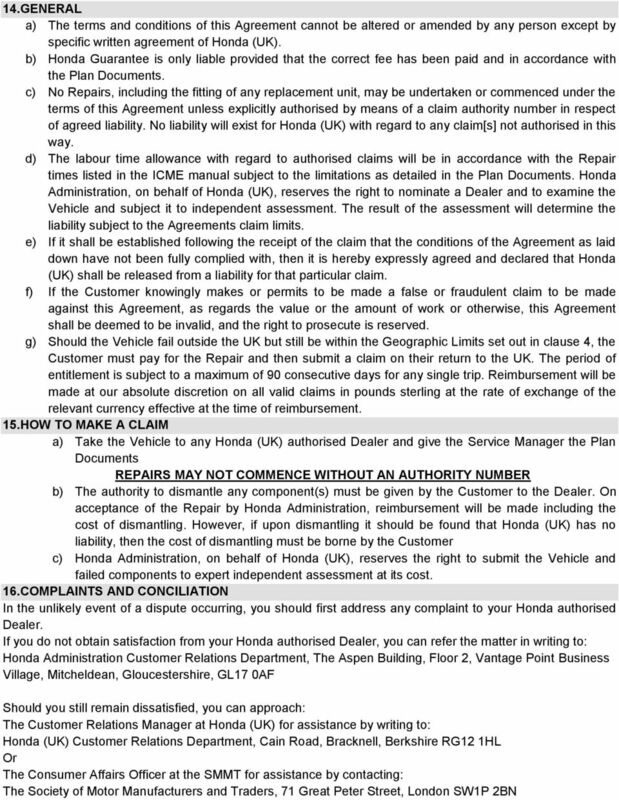 9.TERMINATION This Agreement shall terminate on the earliest of the following events: a) On the End Date specified on the Plan Documents; b) On Honda (UK) giving notice of cancellation in writing to the Customer. c) Where the Customer is in breach of any of his obligations under the terms of this Agreement. 10.CANCELLATION a) The Customer has the right to cancel this Agreement within 14 days of receiving the Plan Documents. If the Customer exercises their right to cancel within this 14 day period, the Customer will receive a full refund of the amount paid for the Honda Extension to Manufacturer s Warranty. 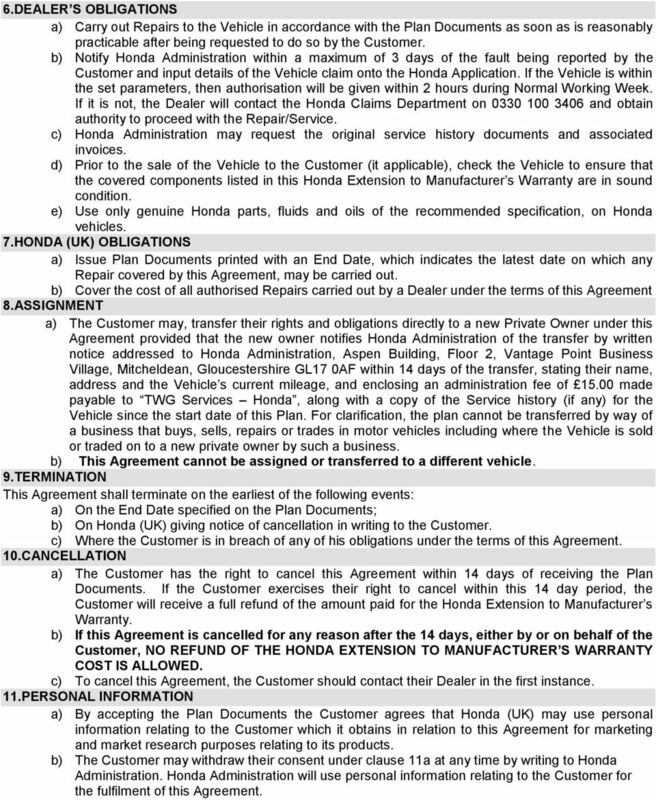 b) If this Agreement is cancelled for any reason after the 14 days, either by or on behalf of the Customer, NO REFUND OF THE HONDA EXTENSION TO MANUFACTURER S WARRANTY COST IS ALLOWED. c) To cancel this Agreement, the Customer should contact their Dealer in the first instance. 11.PERSONAL INFORMATION a) By accepting the Plan Documents the Customer agrees that Honda (UK) may use personal information relating to the Customer which it obtains in relation to this Agreement for marketing and market research purposes relating to its products. b) The Customer may withdraw their consent under clause 11a at any time by writing to Honda Administration. Honda Administration will use personal information relating to the Customer for the fulfilment of this Agreement. 5 12.WHAT THE AGREEMENT COVERS Honda Extension to Manufacturer s Warranty The Honda Extension to Manufacturer s Warranty is designed to assist you towards the cost of repairs if the vehicle suffers a defect caused by a material or manufacturing defect of its original equipment which is a mechanical or electrical component, not shown in the list of exclusions in section 13, 1) Hire Car Contribution Where a Vehicle is off the road undergoing an authorised Repair for more than 24 hours the Customer may qualify for a contribution of up to 40 per day (inclusive of VAT) towards the cost of a Hire Car for a maximum of 5 days after the first 24 hours of the Vehicle being off the road. A replacement vehicle will only he provided for the Customer if the Vehicle is being repaired under the terms of the Honda Extension to Manufacturer s Warranty and prior authority has been obtained from the Honda Administration. Hire cars are subject to availability and to the supplier s terms and conditions. Among other things these terms and conditions will require, or include: a) Production of a full driving licence valid at the time of issue of the hire vehicle. b) Restrictions on acceptability of driving licence endorsements or the absence thereof. c) Limitations on the availability and/or engine capacity of the replacement vehicle. d) A cash or credit card deposit e.g. for fuel. e) Drivers to be aged at least 21 years or over and to have held a full driving licence for at least 12 months. 2) Complimentary Hondacare Assistance: Hondacare Assistance includes the following, each of which Honda (UK) may provide in its absolute discretion; subject to that discretion, Honda (UK) will use all reasonable endeavours to provide you with assistance. i. Honda Home Assistance If your Vehicle breaks down at home, and we authorise Honda Home Assistance, we can endeavour to send an appointed agent to your doorstep. If the Vehicle can t be repaired, we can endeavour to take it to the nearest Dealer, or a closer destination, if you prefer. Just so you know, if you have to ask for Honda Home Assistance, you won t be able to ask for the Honda Recovery Assistance services. ii. Honda Roadside Assistance If your Vehicle breaks down at the roadside, and we authorise Honda Roadside Assistance, we can endeavour to get help to you wherever you are in the UK. Where the Vehicle can t be repaired in a reasonable period of time, you may be able to benefit from the Honda Recovery Assistance services. iii. Honda Recovery Assistance If we can t fix your Vehicle at the roadside, and we authorise Honda Recovery Assistance, we can endeavour to arrange for you, and up to four passengers and your Vehicle to be transported to any single mainland UK destination. This includes the Isle of Man and the Channel Islands (in these cases, you ll have to pay the ferry costs). If you are towing a trailer or caravan, we can also endeavour to recover this, although there are certain weight and size restrictions (see terms and conditions, available from Honda customer relations). Where the Vehicle cannot be fixed at the roadside we may, at our absolute discretion, choose to provide one of the following: a) A replacement hire car, for up to 72 hours. This would be subject to the terms and conditions of the hire company, or b) Public transport for you and up to four passengers, or c) Transport to, and accommodation at, the hotel of our choice for you and up to four passengers on a bed a breakfast basis, Hire cars are subject to availability and to the supplier s terms and conditions. Among other things these terms and conditions will require, or include: Production of a full driving licence valid at the time of issue of the hire vehicle Restrictions on acceptability of driving licence endorsements or the absence thereof Limitations on the availability and/or engine capacity of the replacement vehicle A cash or credit card deposit e.g. for fuel Drivers to be aged at least 21 years or over and to have held a full driving licence for at least 12 months. 6 Please note: Replacement vehicles cannot be supplied with a tow bar, and therefore we can endeavour to recover your caravan or trailer will, if eligible, under Hondacare Recovery Assistance with your Vehicle. iv. Honda Message Service Should the unforeseen arise, if we authorise Honda Home Assistance, Honda Roadside Assistance or Honda Recovery Assistance, it s good to know that we can try to assist in getting a message to a relative or colleague to let them know what s happening, where you are and that you re safe. 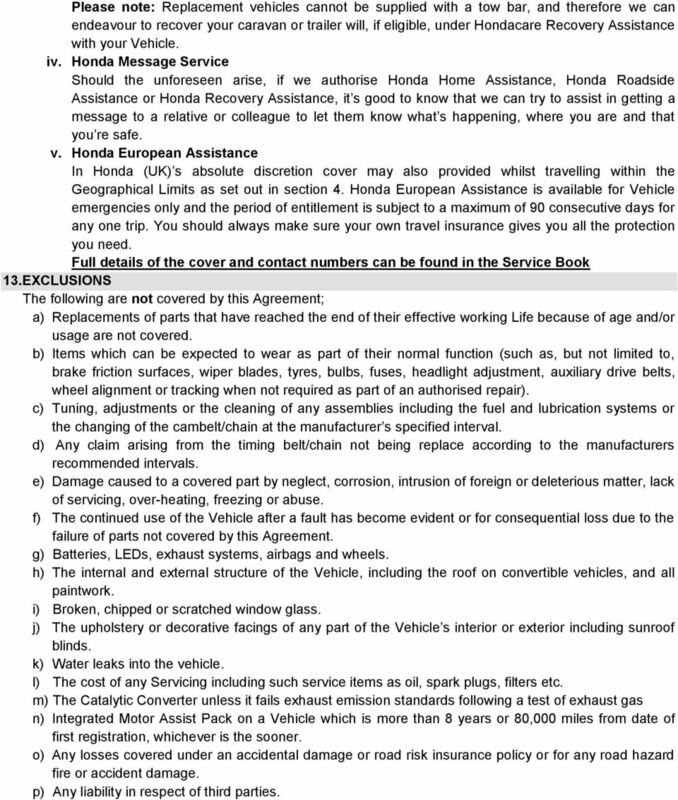 v. Honda European Assistance In Honda (UK) s absolute discretion cover may also provided whilst travelling within the Geographical Limits as set out in section 4. Honda European Assistance is available for Vehicle emergencies only and the period of entitlement is subject to a maximum of 90 consecutive days for any one trip. You should always make sure your own travel insurance gives you all the protection you need. Full details of the cover and contact numbers can be found in the Service Book 13.EXCLUSIONS The following are not covered by this Agreement; a) Replacements of parts that have reached the end of their effective working Life because of age and/or usage are not covered. b) Items which can be expected to wear as part of their normal function (such as, but not limited to, brake friction surfaces, wiper blades, tyres, bulbs, fuses, headlight adjustment, auxiliary drive belts, wheel alignment or tracking when not required as part of an authorised repair). c) Tuning, adjustments or the cleaning of any assemblies including the fuel and lubrication systems or the changing of the cambelt/chain at the manufacturer s specified interval. d) Any claim arising from the timing belt/chain not being replace according to the manufacturers recommended intervals. e) Damage caused to a covered part by neglect, corrosion, intrusion of foreign or deleterious matter, lack of servicing, over-heating, freezing or abuse. f) The continued use of the Vehicle after a fault has become evident or for consequential loss due to the failure of parts not covered by this Agreement. g) Batteries, LEDs, exhaust systems, airbags and wheels. h) The internal and external structure of the Vehicle, including the roof on convertible vehicles, and all paintwork. i) Broken, chipped or scratched window glass. j) The upholstery or decorative facings of any part of the Vehicle s interior or exterior including sunroof blinds. k) Water leaks into the vehicle. l) The cost of any Servicing including such service items as oil, spark plugs, filters etc. m) The Catalytic Converter unless it fails exhaust emission standards following a test of exhaust gas n) Integrated Motor Assist Pack on a Vehicle which is more than 8 years or 80,000 miles from date of first registration, whichever is the sooner. o) Any losses covered under an accidental damage or road risk insurance policy or for any road hazard fire or accident damage. p) Any liability in respect of third parties. Definitions relating to Section 1 Motor Breakdown Assistance. (Only available if you have applied for a Decreasing Mortgage Cover Plan or a Level Protection Plan). MINI Insured Emergency Service. Your Policy Handbook. This product is provided by Mondial Assistance (UK) Limited MINI Insured EMERGENCY SERVICE This booklet contains three separate documents for warranty. Genuine BMW Accessories. The Ultimate Driving Machine. BMW Trackstar. tracked. recovered. BMW TRACKSTAR. Policy Summary. Keep this wording safe. In the event of an accident, call us on to help you resolve your claim. MINI Car Insurance Policy Summary. Protection Friends Life Protection Account Key features of Mortgage Income Protection Cover Why is this document important? The Financial Services Authority is the independent financial services regulator. Car insurance policy summary. Making a claim. Who provides the cover? Types and duration of cover. What if I want to cancel? MINI FLEET Policy Summary 2 Mini Fleet Policy Summary MINI FLEET Policy Summary Your RSA Mini Fleet Policy is an annual contract which may be renewed each year subject to your needs and our terms and conditions. BE MINI. MINI ROADSIDE ASSISTANCE & ACCIDENT MANAGEMENT. Extended Warranty Insurance Product Disclosure Statement and Policy Wording Effective 1 January 2012. Issued and Underwritten by The Hollard Insurance Company Pty Ltd ABN 78 090 584 473 AFS Licence No.